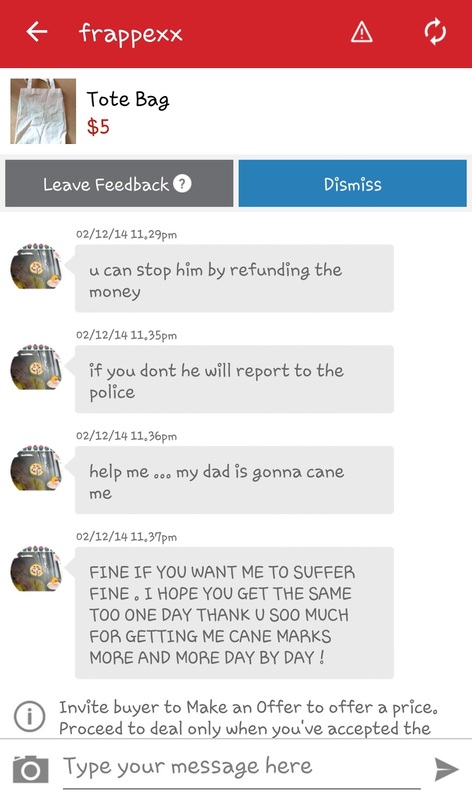 So recently, I received this (not so) threatening message on Carousell. 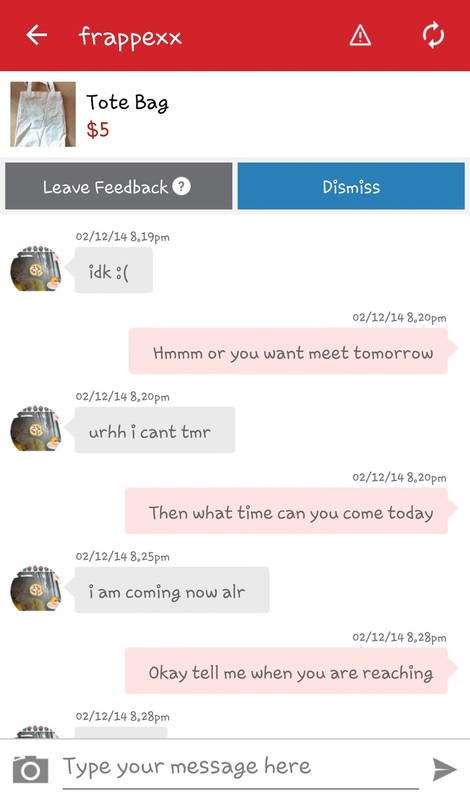 This app is getting out of hand (kids below 12 years old are using it....) and I am meeting interesting people day by day. WOW. Let the screenshots do the speaking. I don't even bother cancelling her name because I should better warn you guys about her (just in case you meet her in the future). Well, that doesn't mean she can't change her name. LOL. 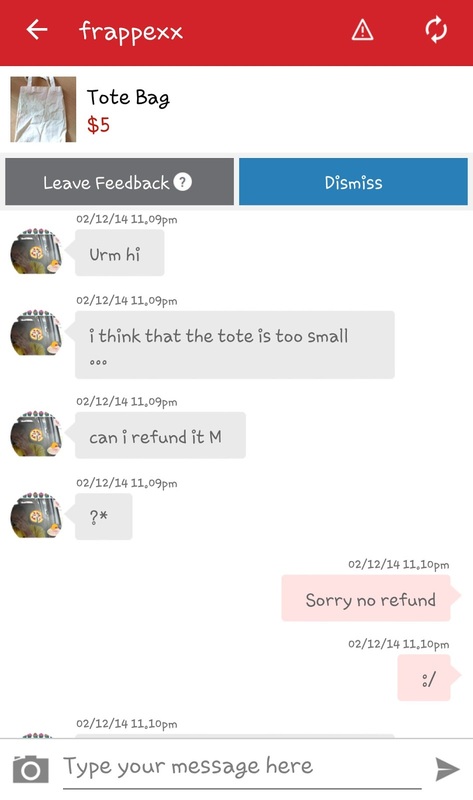 So I have posted this Tote Bag for sale at a freaking low price of $5 but she still want to bargain. 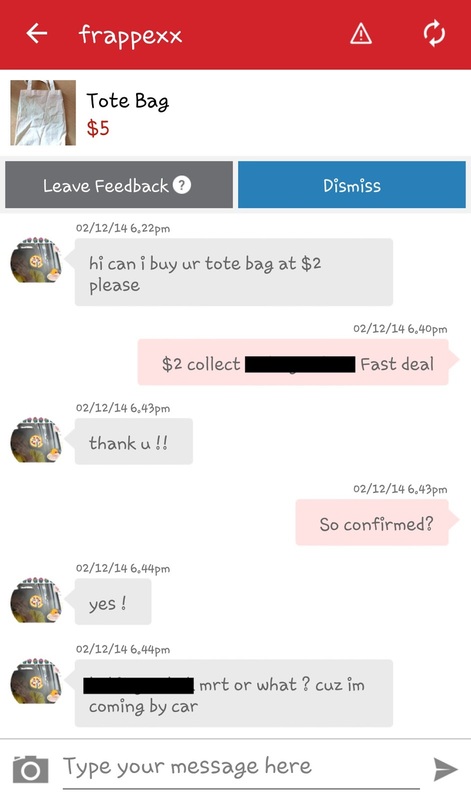 Me being all so nice at the month of December (I kid you not) decided to let her bargain to $2 (3 bucks differences people) if she can come at collect it at my convenience. But later did I know this was just the beginning of this horrible encounter with this girl. TAKE NOTE: SHE BROUGHT $10 ALONG. So excuse me miss, you can have $10 but you cannot buy something at the original price of $5? I decided to let this off because I was in a pretty good mood (surprisingly). 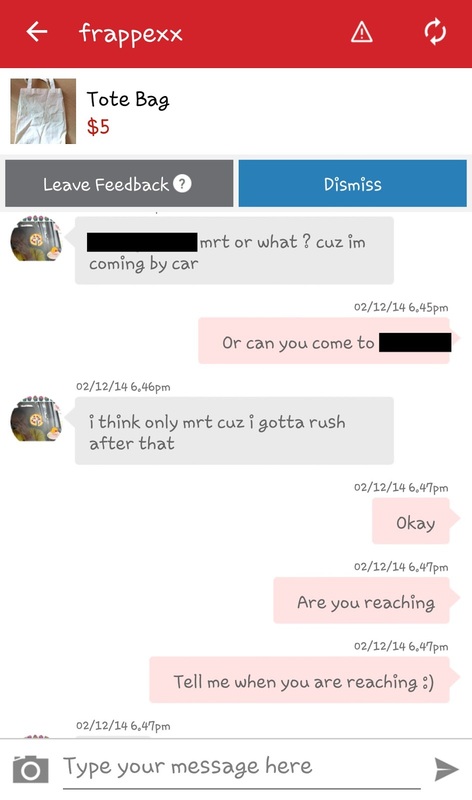 Since she said she is coming by car. 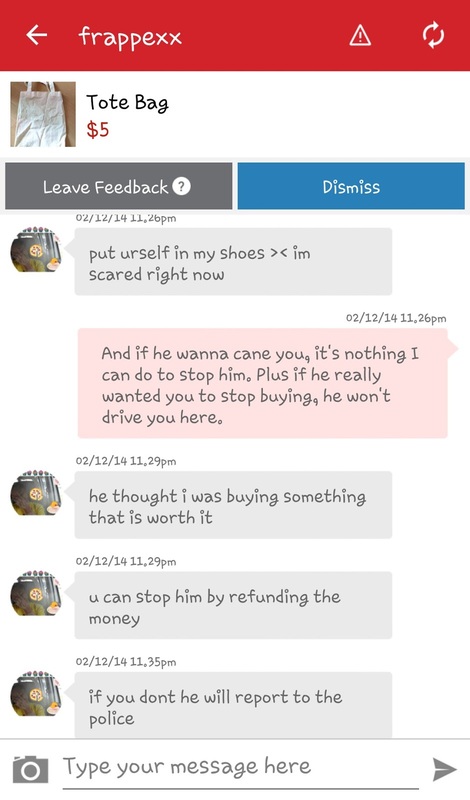 I decided to be nice and told her a place to stop so that she will be more convenient when passing me the money. But obviously she didn't know where is it, well you can't blame a 11 years old kid can you? Well, I was wrong. You can blame a 11 years old kid. Read further to find out why. 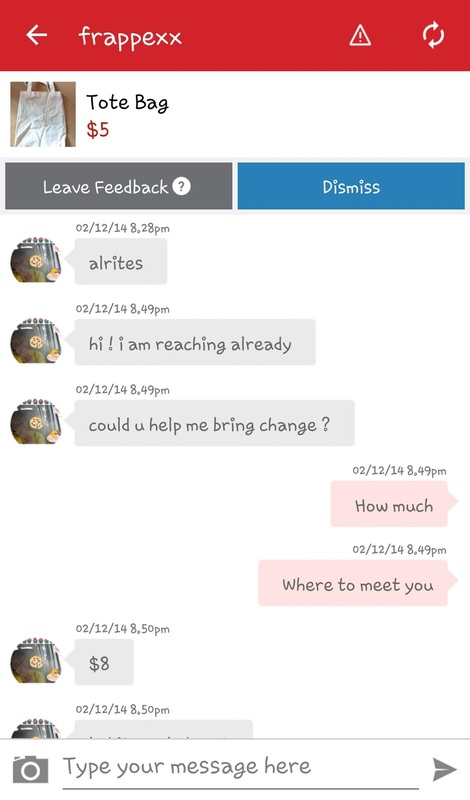 Just look at the dramatic change after this message. I promised you she is totally two faced. 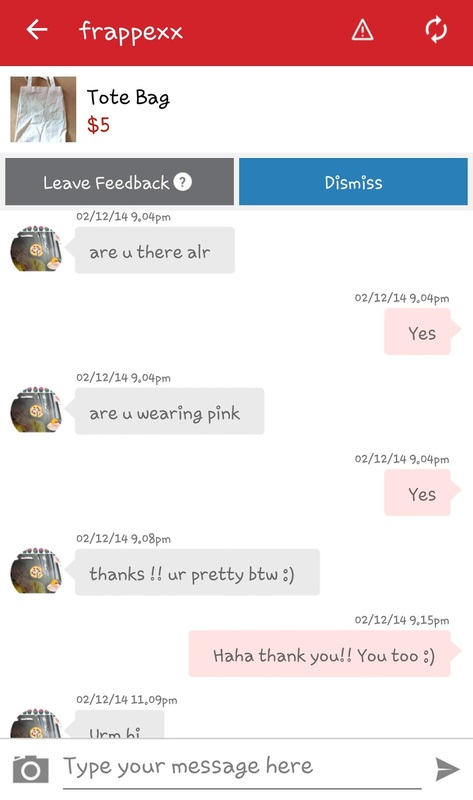 Sorry a bit awkward to received compliments from strangers (furthermore it's a girl). And I just want to leave a good impression. LOL. THIS IS WHERE ALL IT STARTED. 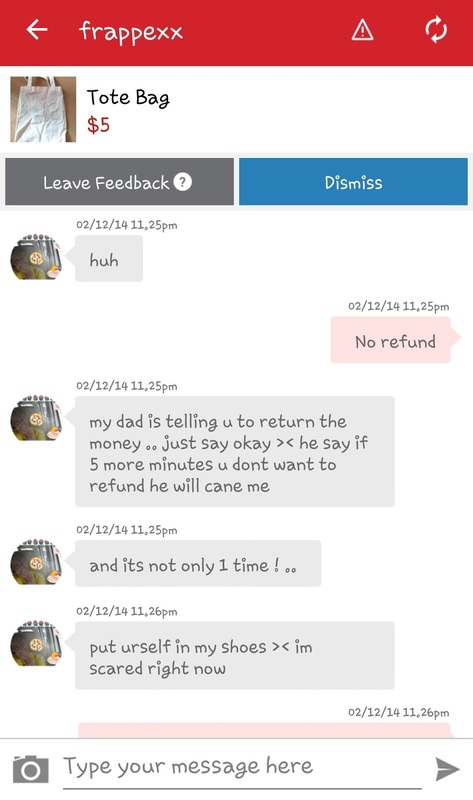 Firstly, there is no such thing as refund on my Carousell. Next, you did not asked for size. 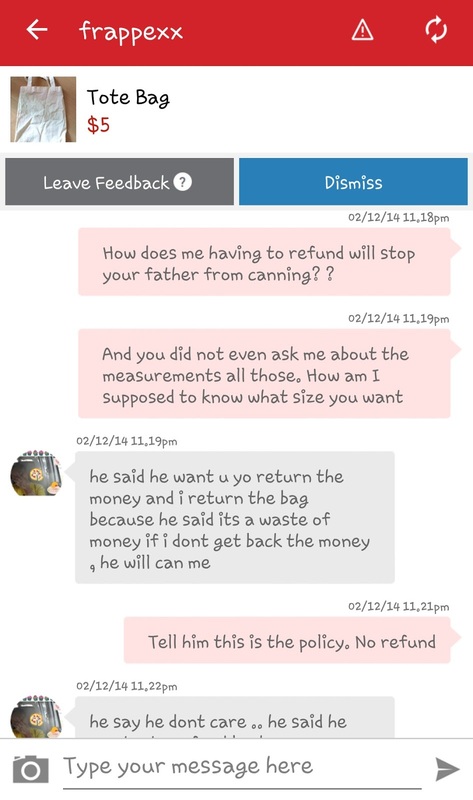 Unlike other buyer which asked me to model it for them to see so that they can see or asked for measurements, You asked for nothing but discount. "Let my dad talk to you" Well sure. 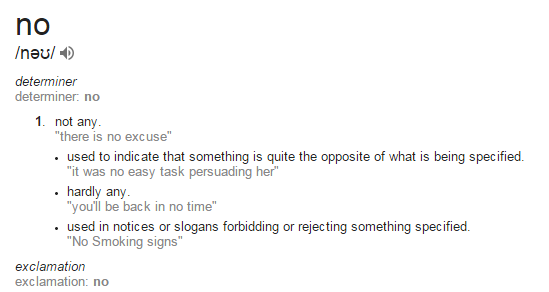 I was this close to 'give in' because I sort of pity her. 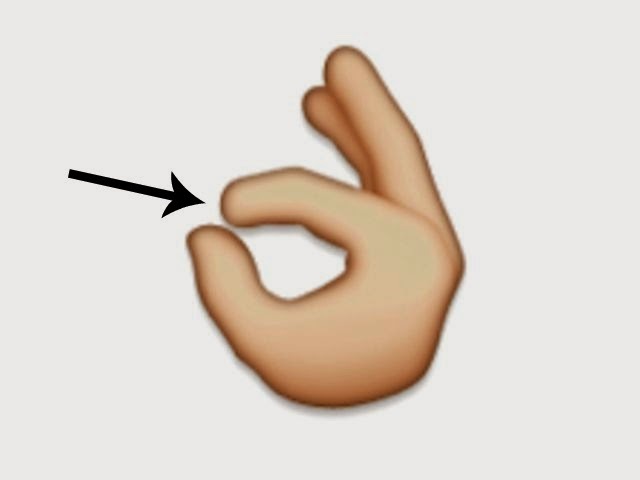 This close. 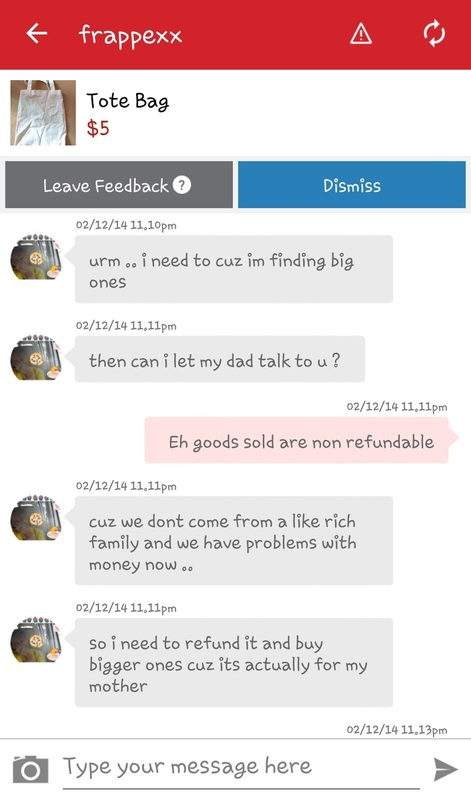 But I was glad I didn't allow the refund to happen because this will only mean I am agreeing to future refund issue to happen AND SHE ALREADY ASKED FOR $3 DISCOUNT. I am not saying you cannot ask for discount, most of the time we do try our luck to see if we can ask for lower price. However, when the goods are already in such a low price (in this case $5), you DO NOT be so thick-skinned and asked. 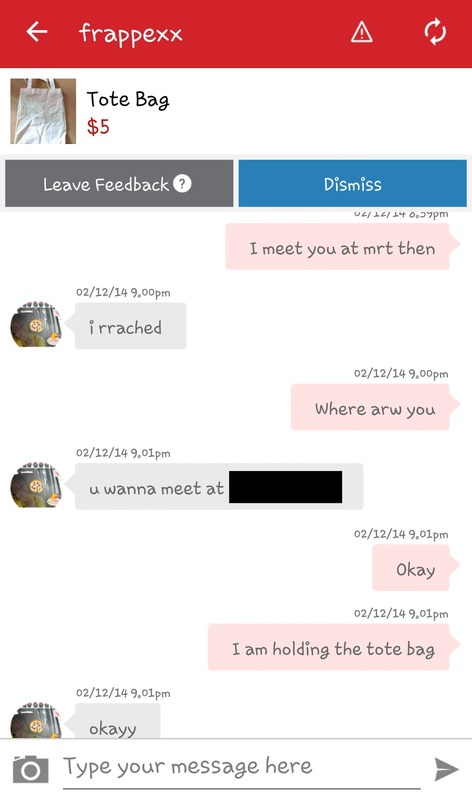 And she is so thick-skinned to ask for $3 discount and I am so nice to allow this to happen. One shall not be so greedy in life or else you will suffer/pay back later. This is what happened to her I guess. 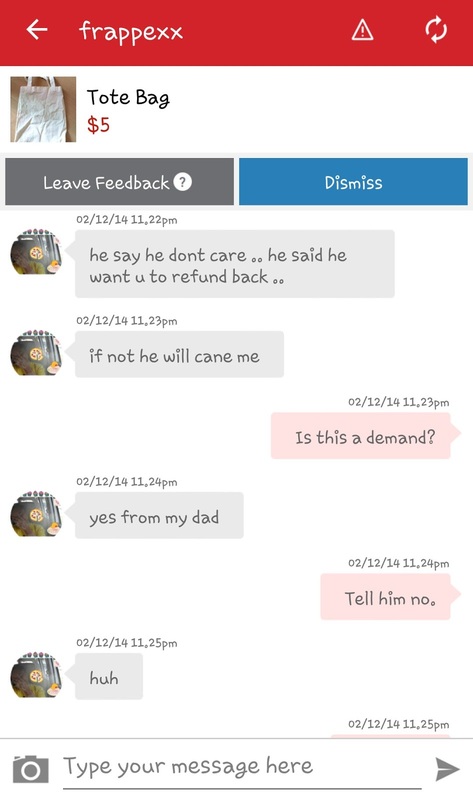 The most annoying part is she kept using "MY FATHER MY FATHER". And it's 11+pm, kids at your age should just go and sleep and not use your phone. Because I want to sleep. 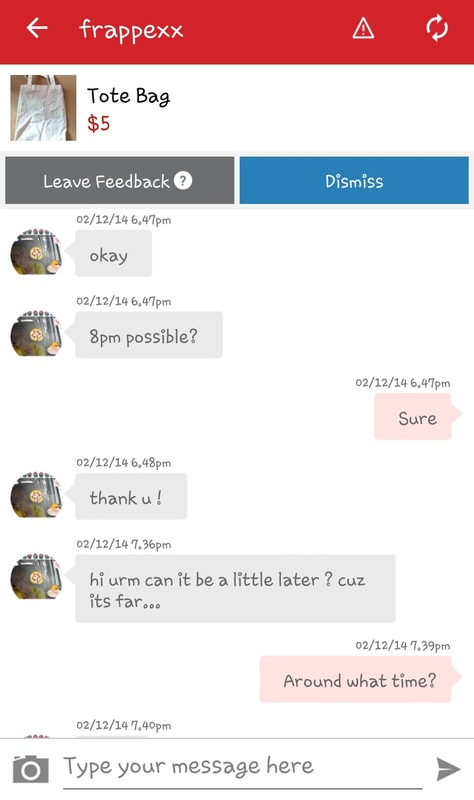 I am tired of doing assignments and you have to be the annoying one kept spamming me messages to ask for refund when I already said "NO". 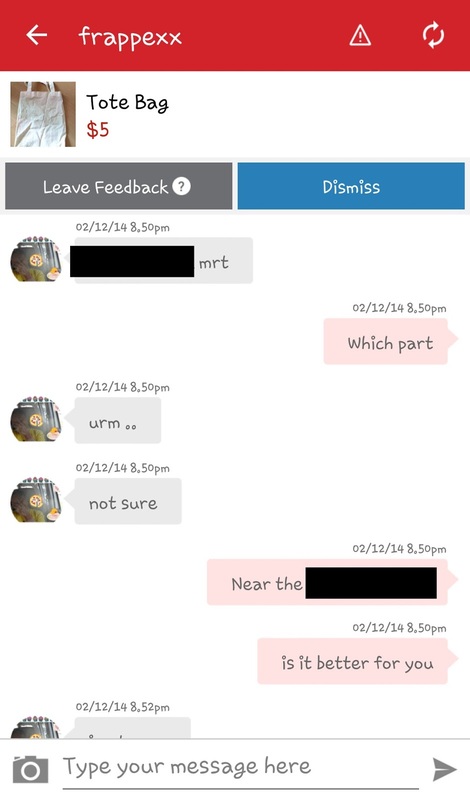 Which part of "no" do you not understand? Up till now, I still don't get how I am having such a huge impact on your father because I am just nobody HA. 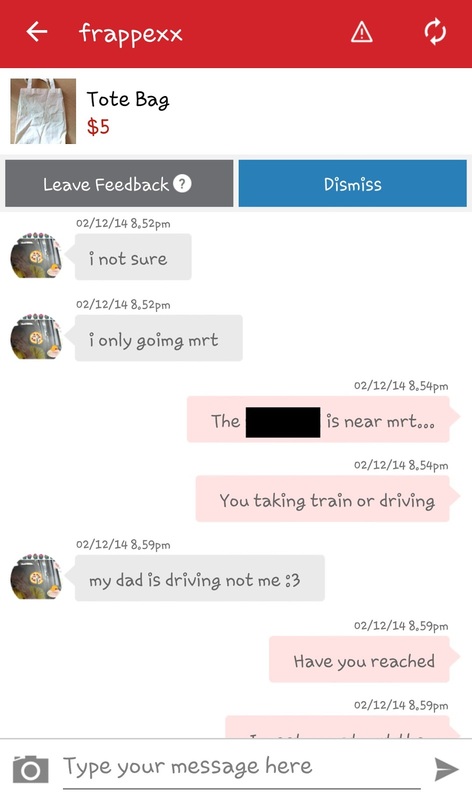 I wanted to 'play' along and use 'MY FATHER' but it just shows how childish it's to bring my dad in. But well, I was taught to build rapport with the person you are speaking with. And one way of building rapport is to mirror their language. "My dad says no refund." "My dad says it's a waste of time talking to you about NO REFUND." "My dad says you should go to bed right now and stop using phone." etc. 'Not the first time', means you never learn from your lesson. Then maybe it's time to grow up and learn something. 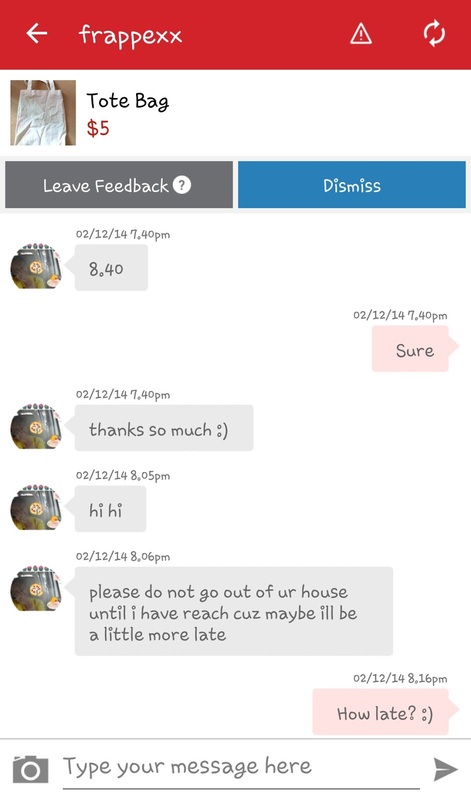 Hopefully you will learn something like 'Ask for measurements before buying'. Tips for your next shopping girl. 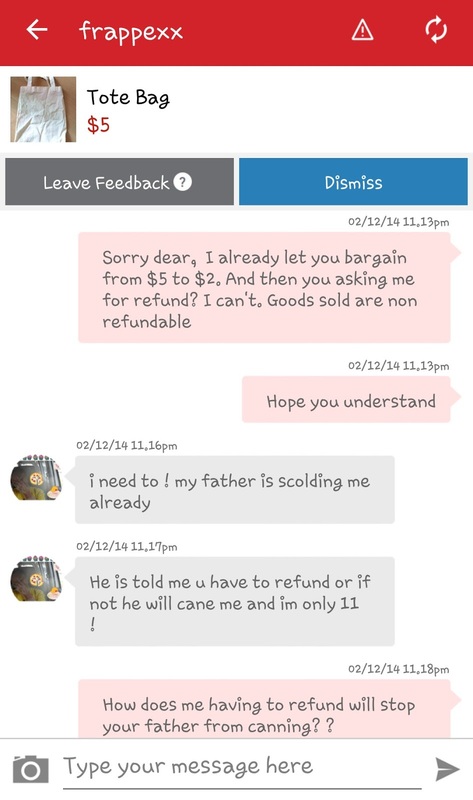 I can't bring myself to put in your shoes because I don't use phone to buy items online when I was 11 years old. I don't ask for discount when it's already so cheap. I don't ask my dad to drive me around to buy things. I don't have a dad that cane me for such nonsense reason. I always ask before purchasing. Am I safe to say your shoes does not even fit me? I can't even put myself in your shoes. And I went to sleep in PEACE. You can say I am cold-hearted and all but I think it's important to stand on your own policy/stand or else people will just climb over your head without you even noticing. Who knows she was just making up stories about her family background and want me to pity her? Not like I have cheated her or something. Quite an interesting read I must say. And I never dream that I will be experiencing one myself.